The great new is we’re still a couple of weeks away from Easter which falls later this year on the 21st. 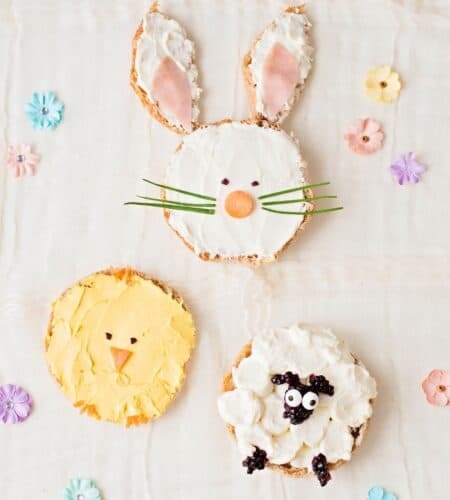 Still plenty of time to make this adorable Easter treat. 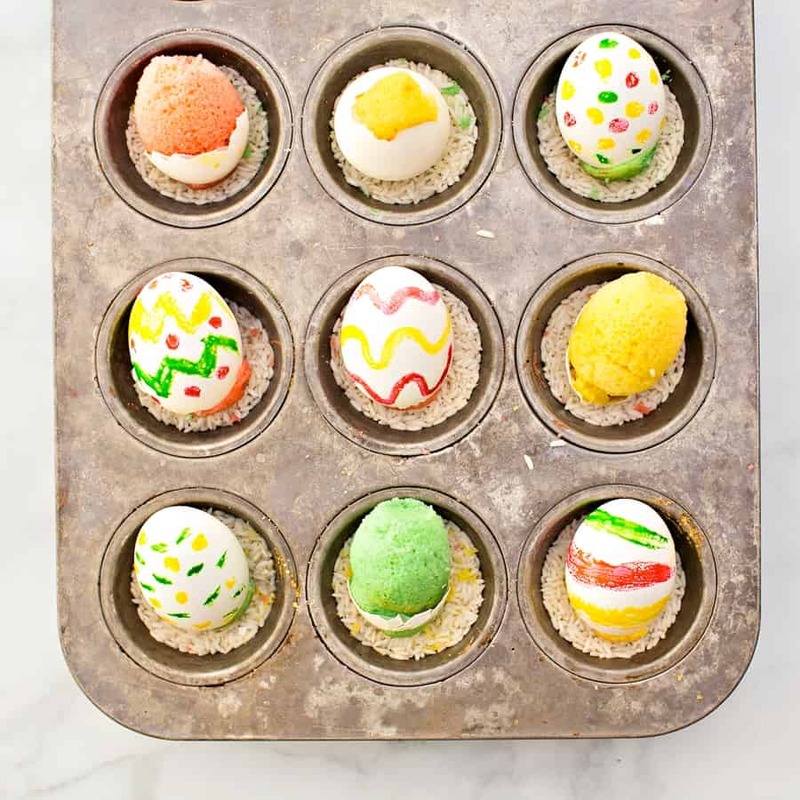 Can we first talk about how cool the idea is to bake batter in eggshells? The idea was inspired by these brownies baked in eggshells which came from a Spanish blog (no longer around). Some digging on the internet and turns out brownies in eggshells are a “thing” that people have done around Easter. 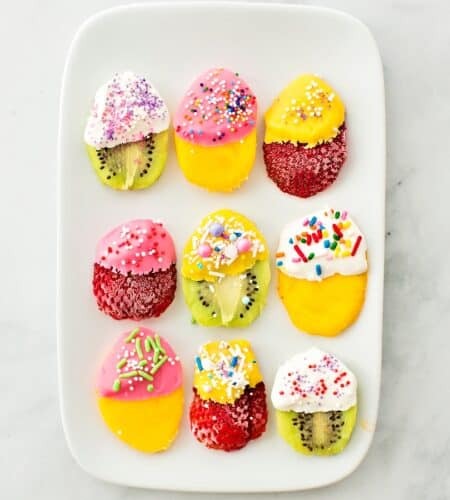 I thought it’d be cute to do a twist with cake batter and decorate them to look like real Easter eggs! No worries this isn’t real paint that can be toxic, we used gel food coloring on the outside to “paint” the shells and cleaned the egg shells thoroughly before cooking of course. We also tinted the cake batter pastel colors to go along with the Easter theme. 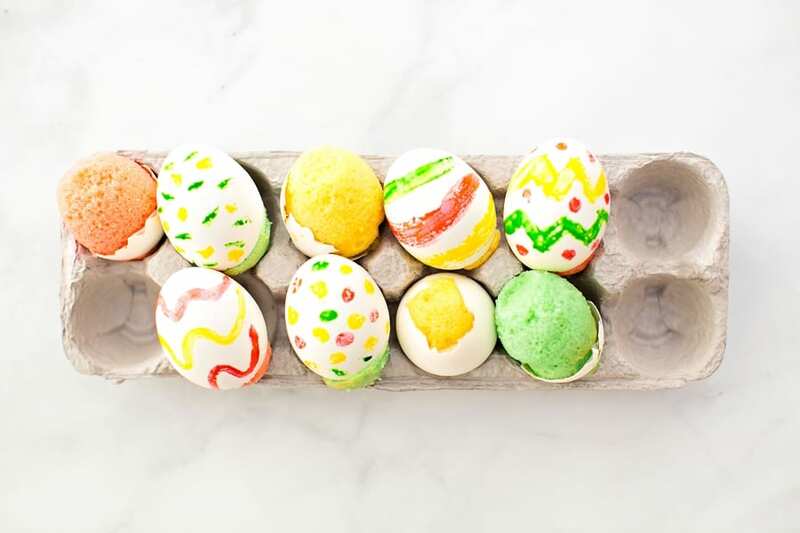 Using a cake mix makes it even easier to “whip” up these sweet cakes in eggshells. Scroll down to watch the video below to see how our method for blowing out and cleaning the eggs. As well as how we filled and decorated the eggs. 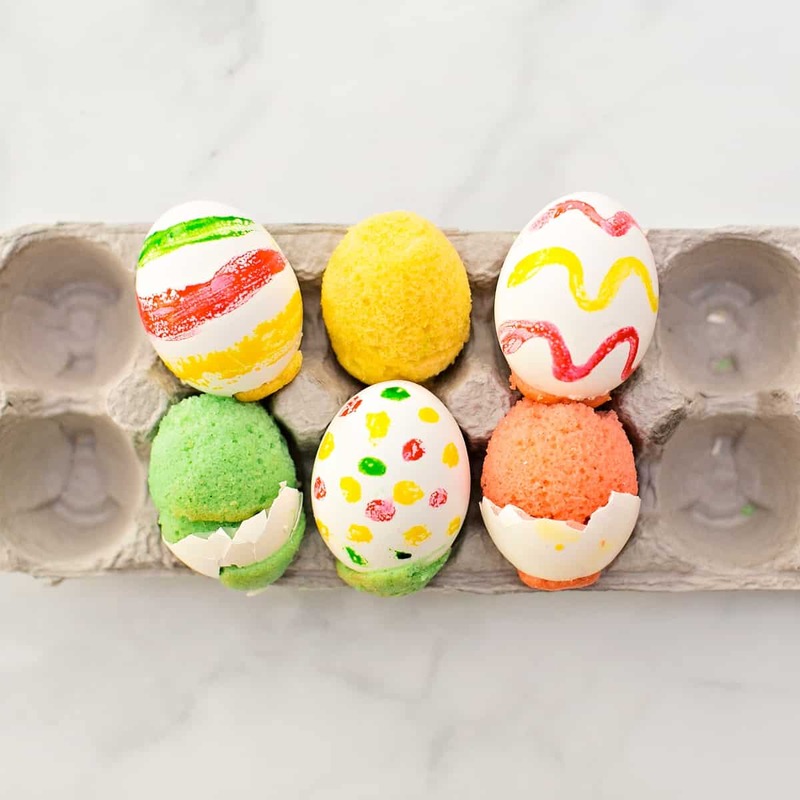 The basic premise on how to make these cakes in eggshells is pretty easy; empty and clean the shells, fill and bake. However there are some tricks you’ll want to know along the way. Use a sharp knife to tap a hole on the wider bottom of the egg, see detailed instructions below. Clean the blown out shells in a solution of salt water, see detailed instructions below. To make your empty eggshells stand up while baking, place them on small bed of rice on a muffin tray. 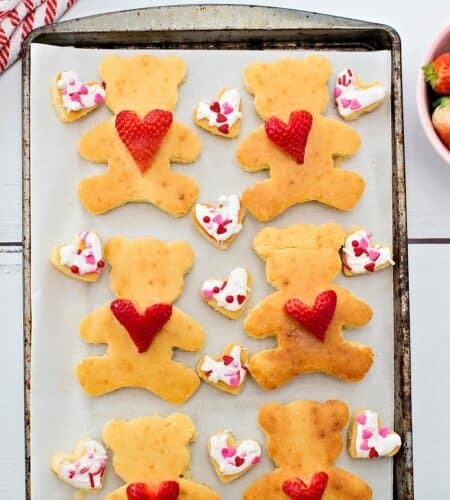 Create a little indent in the middle so they “sit” straight up when they bake. Other than that the cake mix batter and piping is very straightforward. Just use the direction on your cake mix. We used a yellow cake mix, but you can use any flavor. We also added a teaspoon of oil swirled inside each egg to make sure the cake doesn’t stick to the eggshells when unpeeled. We tested with and without and the ones that had oil came out much cleaner. Various articles on brownies in eggshells we read suggested filling 2/3 to 3/4 of a way up the shell so that is what we did but that ended up being way too much. The batter spilled and overflowed after baking. Not to worry if this happens to you, you can simply let them cool for 5-10 minutes (not too long or the cake will “set”) and simply scrape off the extra cake batter. Watch the video to see how we did this. Some of the rice sticks to the eggshells so you can scrap off too. 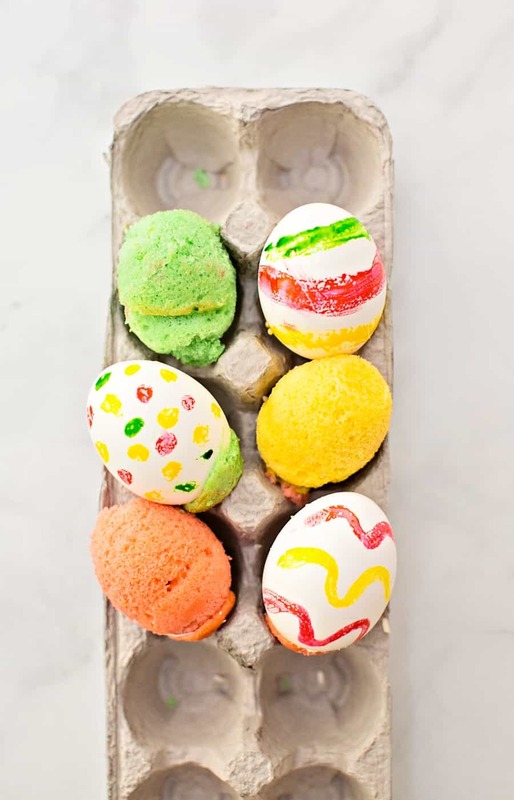 Do the decorating AFTER the cake is baked in eggs and when fully cooled. Gel food coloring with a clean small paint brush works well. 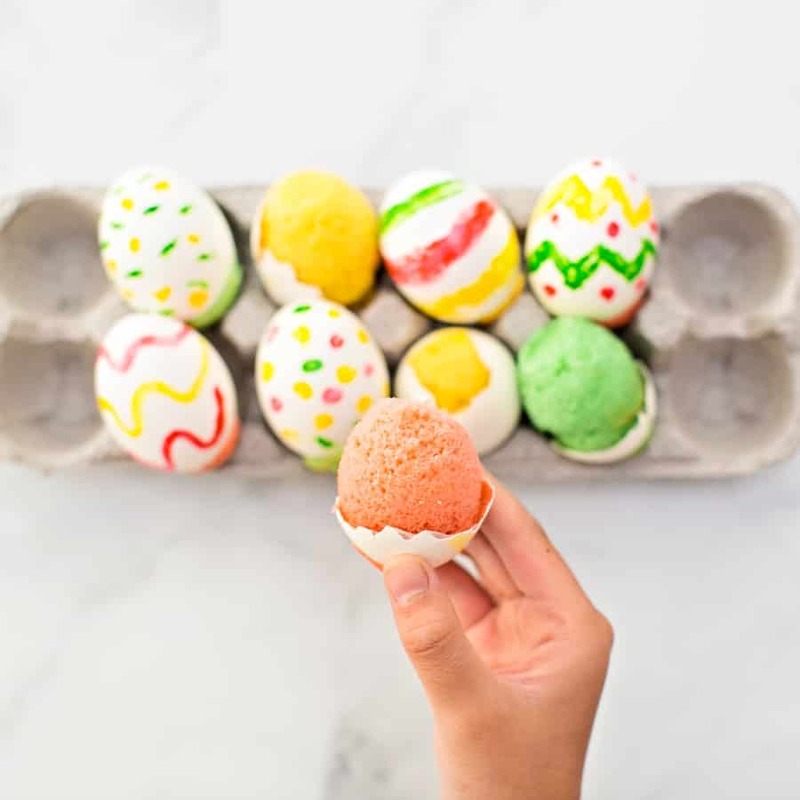 However, if you had some oil residue drop down on on the outside of your egg after you coated the inside, the coloring won’t mix well with the oil and therefore won’t dry well. We like the watercolor look of the gel painting but if you want the paint to dry completely, use food markers. The photos here are shown with gel food coloring but we tested the markers (not shown). Watch the video to see how we painted. Step 1. 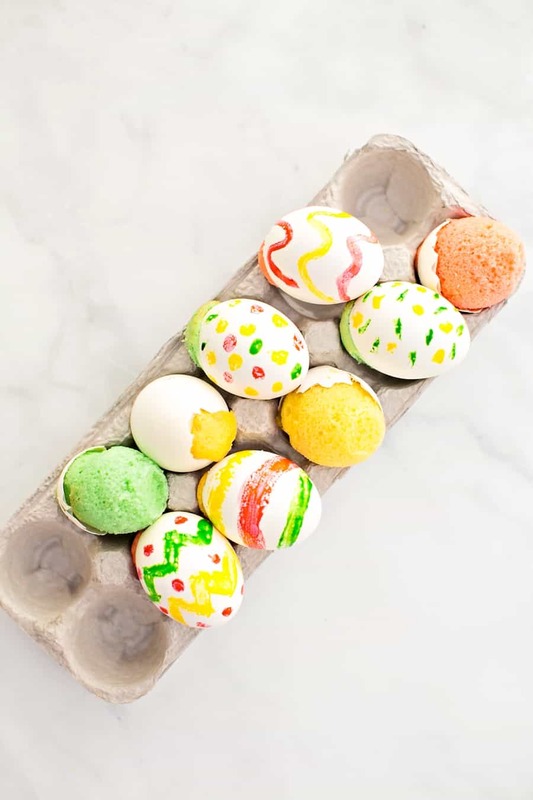 Blow out your dozen eggs (one cake mix is enough to fill about a dozen eggs). Use a sharp knife to tap a hole on the wider bottom of the egg, then use the tip of the knife to make small cracks around your hole. Break open the shell gently, and make sure the hole is wide enough to insert a piping tip. You can use then insert a toothpick to break up the yolk then empty the egg in a bowl to save for later. If your cake mix calls for eggs, reserve for that. Step 2. Clean the blown out shells in a solution of salt water, we used about a 1:3 ratio of salt to water. You will need to fill the empty shells with water so they stay submerged and don’t bob around. We let them sit for about 30 minutes in salt water. 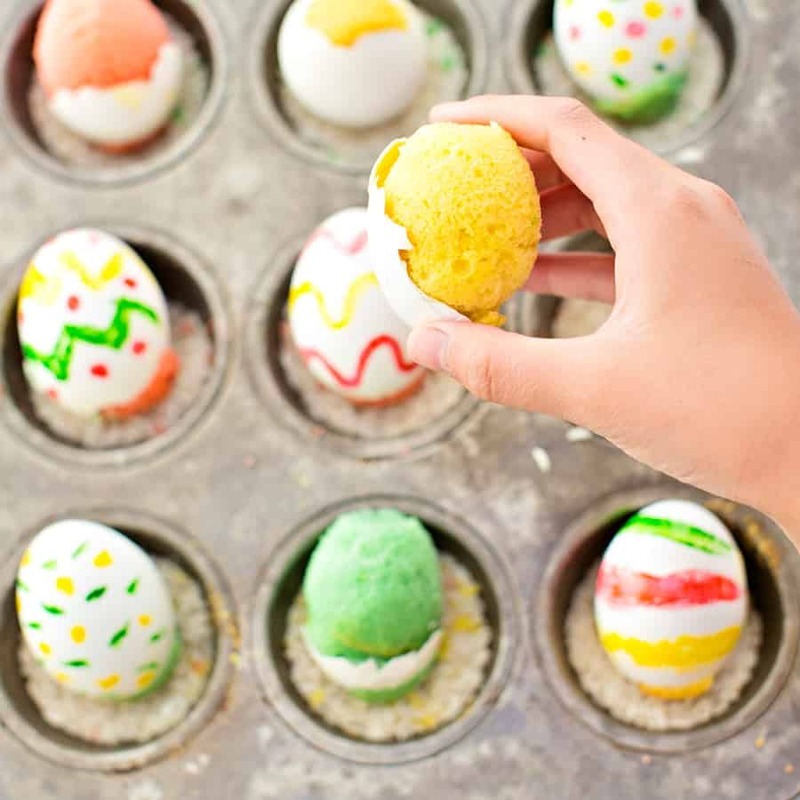 Gently rinse out in cold water and allow the egg shells to dry fully, hole size up. Step 3. Prepare your cake mix according to the package direction and preheat the oven to 350 degrees. Split batter into 3 bowls and tint 3 colors (we made yellow, pink and green – note the cake mix is yellow, so we actually added BLUE to make green cake batter). Step 4. Add your cake batter to a piping bag with the rounded tip. If you only have one tip, you will need to do one color at a time. Step 5. Add a small amount of rice to your muffin tray, make an indent the middle with your finger to lay the egg, hole side up. Add a teaspoon of oil to each egg and swirl to coat all the sides, place on top of the rice. Step 6. Fill the egg shell with batter until halfway full. Don’t make our mistake and do 2/3 or 3/4 full as there will be lots of overflow. However, it’s hard to eyeball exactly so no need to panic. If you have overflow, you can simply let baked eggs cool for 5-10 minutes (not too long or the cake will “set”) and simply scrape off the extra cake batter. Watch the video to see how we did this. Some of the rice sticks to the eggshells so you can scrap off too. Step 7. Bake in a preheated 35- degree oven for 20-25 minutes. if the tops are puffy and spring back when lightly tapped, they are done. Step 8. Let your eggs cool completely, you’re done at this point. It’s so fun to give someone an “egg” and have them crack it open and see cake! However you can go a step further and decorate! We left some cracked open for you to see and some decorated. Simply use some gel food coloring and a small clean paint brush and paint designs. As noted above, if some oil gets on the eggshell, the gel coloring won’t dry well. Use food markers if you want a more matte, dried look. 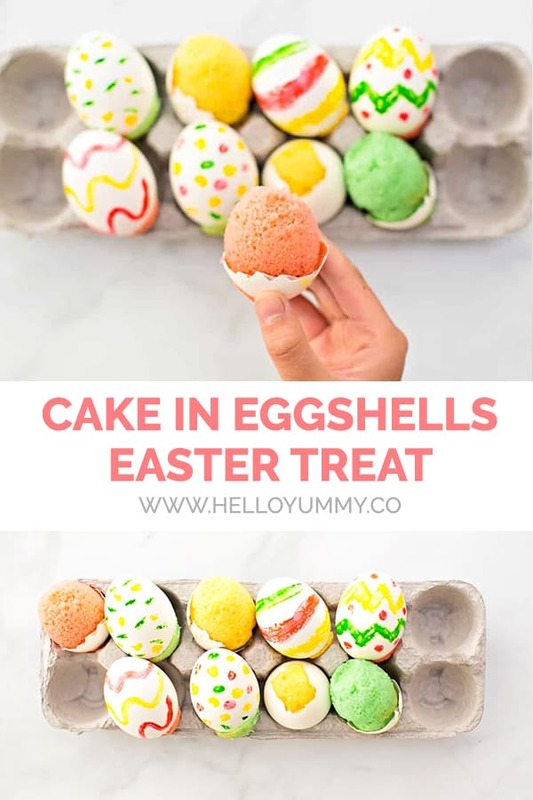 These cake in eggshells were a HUGE hit with my kids! We can’t wait to make more for Easter!